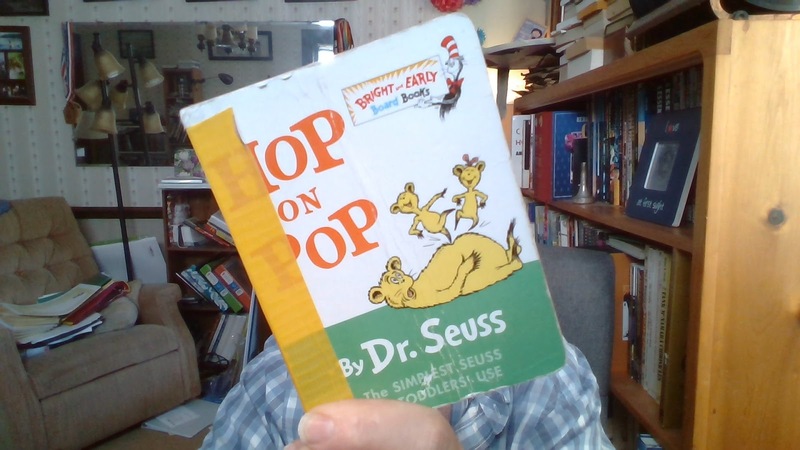 You can see here-- this is how much we love Hop on Pop. It is the first book that we have actually worn out enough to require duct tape intervention. Because I have had the opportunity to read this book roughly seventy squintillion times, I can't really resist the urge to apply some analysis via Close Reading 2.0, the Common Core-flavored version championed by literature-teaching whiz David Coleman. You can follow the links for more details, but let me remind you of the basic rules. Mostly, we have to stay within the four corners of the page. 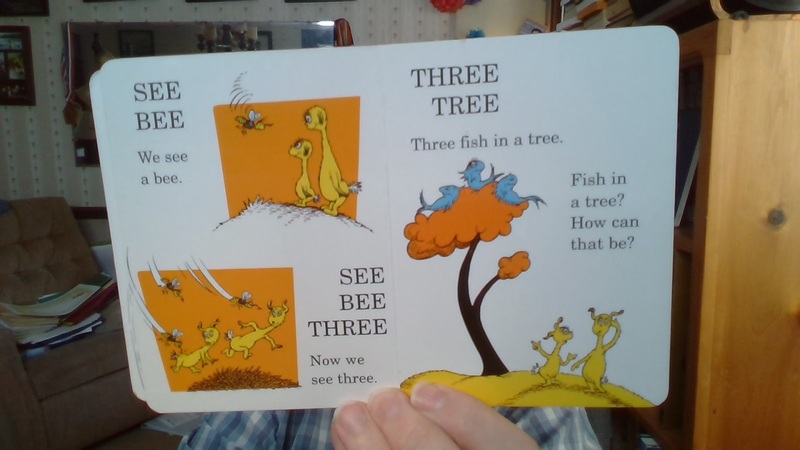 We cannot bring in prior knowledge, background info, or anything else that we can't see on the page (so nothing about Dr. Seuss's medical degree or unfortunate racist streak). For our purposes, we are going to cheat just a little, because the Board of Directors are barely toddlers, so they have very little prior knowledge at all and the printing on these pages is gibberish to them, as they don't yet know the concept of printed words and cannot actually say any words themselves (well, maybe "banana"). This is one of the problems with Coleman's version of Close Reading-- it is humanly impossible to stay within the four corners of the page because all reading involves the use of prior content knowledge. But we'll do our best to plumb the depths of this text. We are immediately presented with a puzzle- Pup is up, but without a point of reference, we do not know how far up, nor how Pup got there. Is Pup flying? Jumping? Has Pup been shot out of a cannon? There is much we do not know, and this troubling uncertainty in frame of reference will be a continuing theme in the work. 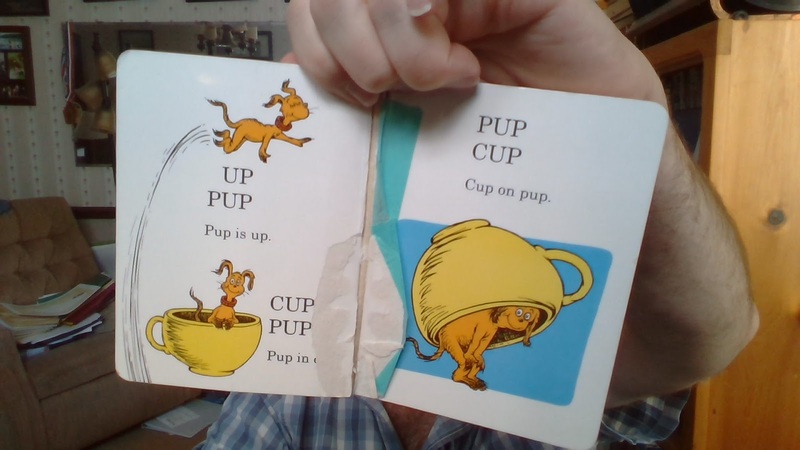 For next we see Pup in a cup, but we do not know if Pup is tiny, or the cup is huge. Then, in the third image of the triptych, a reversal, with the cup now on top of Pup. But notice that Pup in this image has shed his collar! Has the reversal of roles brought about Pup's liberation? Pup looks happy. By accepting the burden of cuply oppression, has Pup now achieved a sort of freedom? Like many moments in the text, we will have to set that aside for the moment, as the work is episodic in nature and we must look for thematic links between the episodes. We next encounter the character Red, who first is in bed alone, and then with three other individuals. 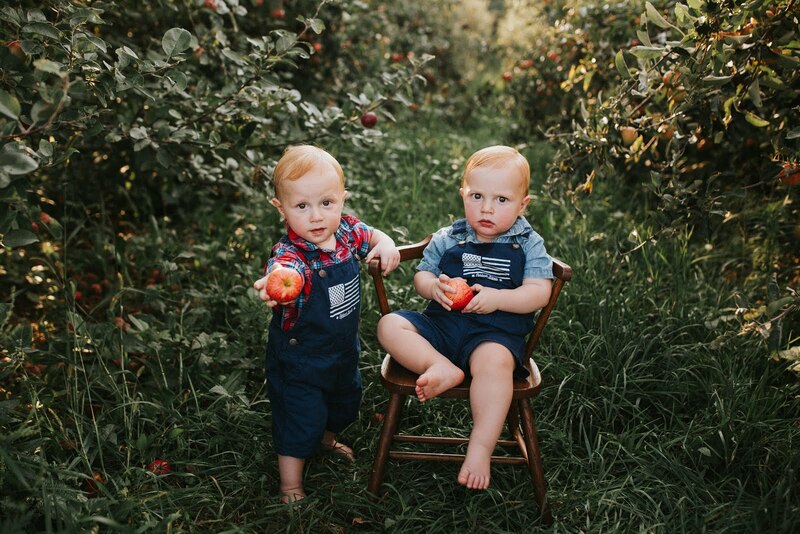 While Red could be a male or female's name, Ned, Ted and Ed all evoke traditional maleness. One does wonder why Ed appears to be a miniature person. Red, disturbingly, is the one character in the book to have buttons, but Red also shows no sign of arms. 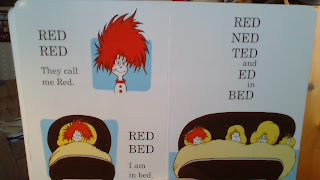 Is this disability the reason Red stays in bed, even sharing it with three partners? Does this episode suggest that the loss of arms makes one unable to cope with life, instead taking to bed so that one's only social and community contacts are there in that soft and protected space? Our next episode is one of the few to take up four pages; it is also one that tests the limits of Close Reading 2.0. 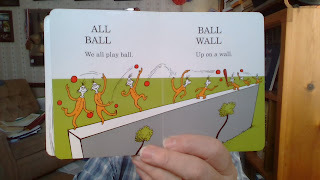 Is the reader supposed to understand that this is a non-traditional use of a wall, or simply accept a small wall that does not appear to mark a boundary between two areas. The eight players appear nearly identical, though they have different numbers of buttons on their clothing (six, five and four). Those different numbers could indicate different levels of status among the players, and we can only guess why one player is privileged to hold the bat. To add to that mystery, we find that when all the characters fall off the wall, one of the players has disappeared. All nine balls are still there, but instead of the original eight players, we now see only seven. The absence of the eighth player coincides with the disappearance from the scene of the bat. 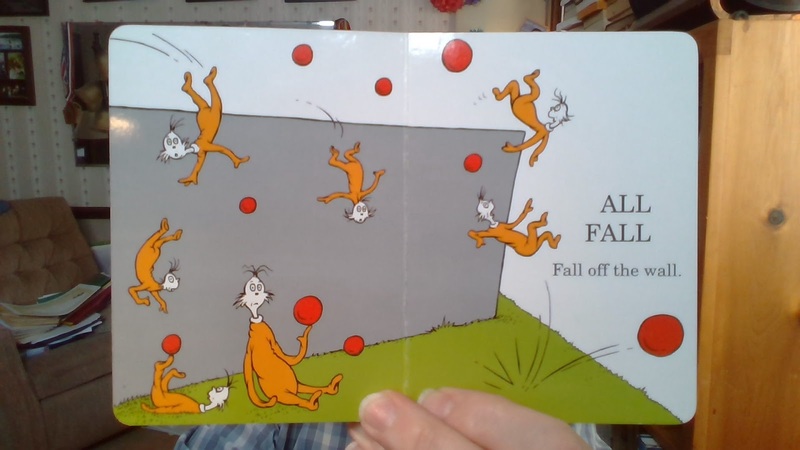 Nor do we see what caused them (almost) all to fall. Should we deduce that the eighth player has gone rogue and started knocking the other players off with his bat? 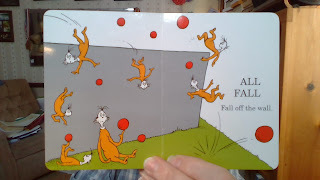 That would fit the position of the seven falling players; some are on the ground, while some are still in the air, indicating they did not all fall at once. They all look dazed, alarmed, even surprised. This episode is the first to hint at destructive forces of chaos and disorder loose in this otherwise idyllic world. With the next page turn, the violence and danger previously only hinted at is now made explicit. Our narrator is being savagely attacked by some sort of beast that is prepared to drive spike-like fangs into the narrator's toe. 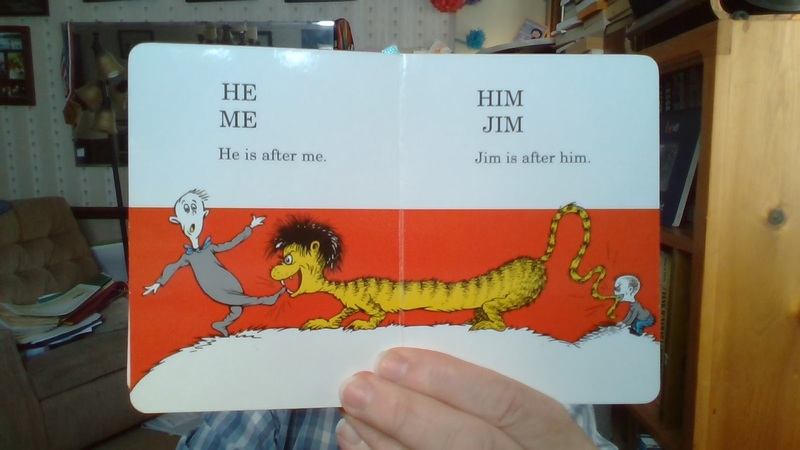 And yet that beast is itself about to be chomped on by a violently aggressive demon child (seriously-- that is one crazy-evil looking little dude). The use of two full pages for this single image underlines its importance to the thematic underpinnings of the text. The universe of the book is not only plagued by eruptions of violence, but those eruptions can come from unexpected sources. No one is safe, not even the aggressors. And the reversal of roles that once looked harmless in the cup-pup episode now reveals a darker undertone. This theme of violence and disorder continues in the next episode, where we briefly establish a quiet, harmless scene of two characters witnessing a bee. Then immediately that quiet is disrupted by yet another violent attack. 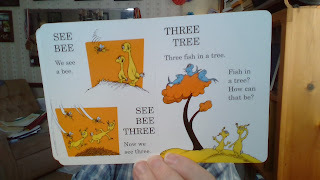 But then, abruptly and without transition, the bees are gone, and we are contemplating three fish in a tree, a clear disruption of natural order (more so if, perhaps, the three bees have somehow been transformed into the three fish). But at this point in the narrative, where the tree-fish might have once been whimsical, they are now disturbing and disorienting. That is perhaps why fish are the best choice for the author's purpose-- a horse or emu would lack the echoes of whimsy more commonly associated with fish. Our characters, unlike the Pup and Red, do not smile cheerfully, but look alarmed and confused. What other horrors could be about to enter their day? Then fortune is again reversed, as Pat almost makes a catastrophic mistake. At first it merely seems that he is going to sit on a prickly cactus, but on closer examination we can see that the cactus's form recapitulates Pat's own form, this dark echo perhaps revealing a dark, shadow self that Pat is on the verge of joining with. 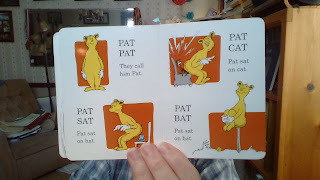 In this reading, the other character does not just offer Pat rescue from self injury, but calls to Pat (whose eyes are now again open) to stop and achieve redemption rather than merging with his darker self. We do not discover if Pat accepts this redemption or not, because we abruptly cut away to two characters, one wearing a traditional female signifier of a hair bow. 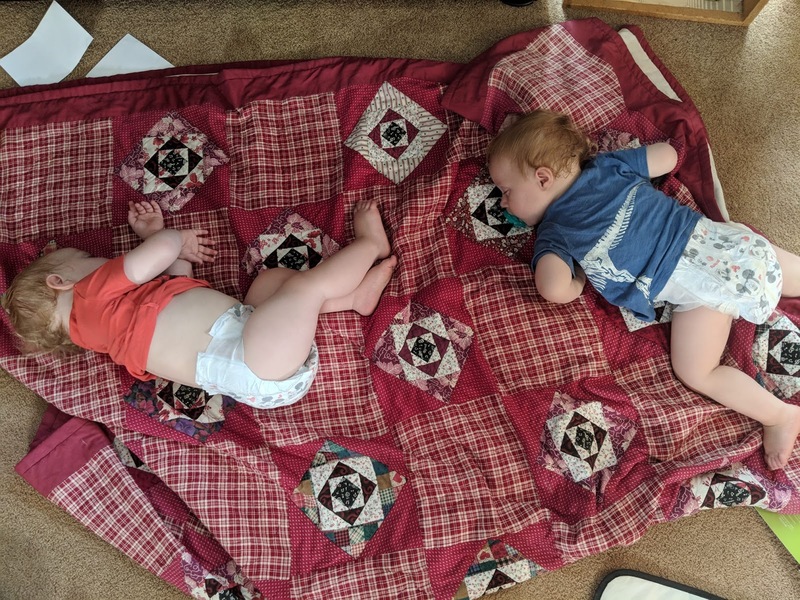 They first tell us that they like to walk, but we can clearly see that they have no feet. 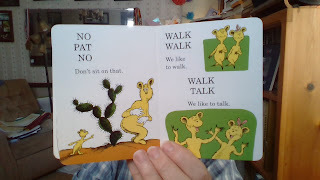 They also tell us they like to talk, but both have their eyes shut and their mouths open, indicating that they are not conversing, sharing or listening to each other, but are simply talking past each other in a disconnected mockery of actual conversation (just as attempting to perambulate without feet is an imitation of walking). When we turn the page, things have only gotten worse. The two smaller characters are happily jumping up and down, assaulting "Pop," apparently a father figure, with their jagged not-feet. And yet Pop himself does not tolerate this and erupts in an alarming expression of anger and frustration, demanding that they stop. (Note: While some may note a resemblance between Pop and Pat, they have different colored noses, and only Pat wears white gloves.) It is a complex and twisted scene in which childish play is interrupted by adult rage, all demanding, and yet the childish play is itself destructive and subversive. It is unclear which characters we are supposed to identify with, as the children are the point-of-view characters for the left-hand page, but Pop is our point of view character for the right page. This signifies, perhaps, that in a world of cyclical violence and chaos, we cannot reliably view any person or point of view as trustworthy or safe. This violent scene can be seen as the climax of the work, leaving just the denouement. A fuzzy haired character, whose outfit denies them even the use of their hands, looks lost and sad contemplating a block of letters that contains words-- but the author has pushed the words together to obscure and confuse meaning, just as the previous episodes have hinted at a reality that is resistant to any conventional sense of meaning and purpose. On the facing page another character walks away, dismissing the first characters plea for interpretation and sense. The second character is walking off the page, surrounded primarily by an empty field of white that denies all context or place and offers no hint of sense or meaning. 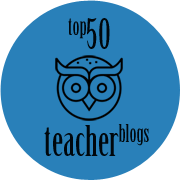 We are back where we started with the flying Pup-- stripped of all useful details that can help us anchor this in a safe and understandable world. 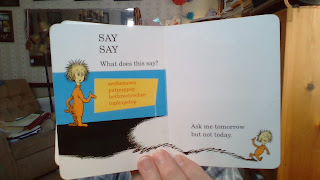 Most chilling, the character says he will provide answers "tomorrow"-- and yet the episodes have shown us that meaning can be deconstructed and destroyed at any moment, violently, chaotically, and without warning. Will the character actually provide meaning and sense "tomorrow"? We are left with the uneasy feeling that he will not as we are left staring into a blank white, adrift in a void of existential disconnection, unsure whether or not we really want tomorrow to come as we gaze into the abyss. 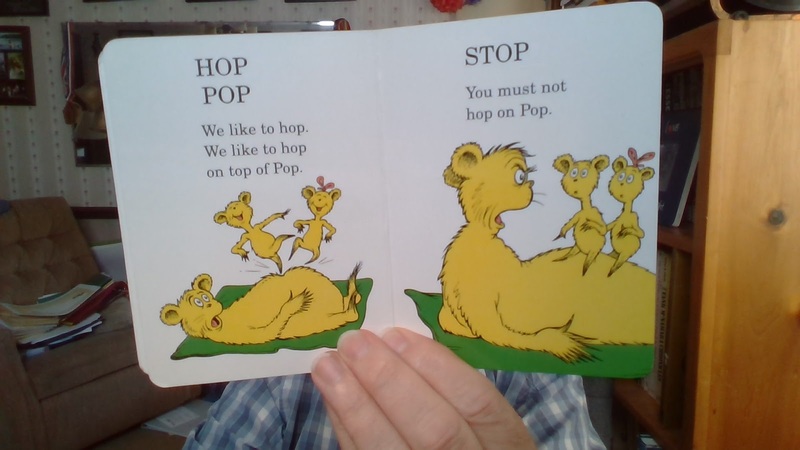 Admittedly, one has to read Hop on Pop several hundred times before the spreading blanket of existential dread really settles in. We could delve into some more text-based questions (why is Pop lying on a green blanket? or is it a towel? has he just showered?) but the Board of Directors will be coming out of executive session soon. 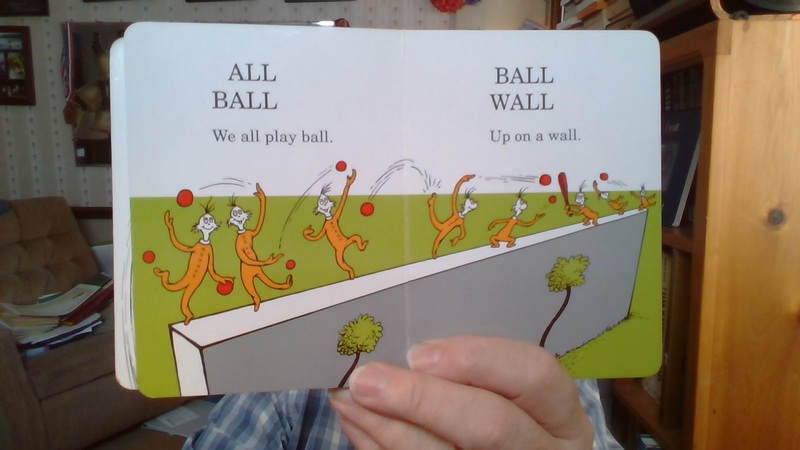 You had me interested until Ball Wall /All BALL and then all I could read or comprehend was blah blah blah blah blah......... That's how my son has spent the last 3 years in middle school. Private high school started today and his favorite teacher is his english teacher....no close reading and not much annotating on the syllabus, but lots of reading and discussing. This is great to read with a little buzz. It takes a lot of 'concentration' to make such awesome observations. Thanks!